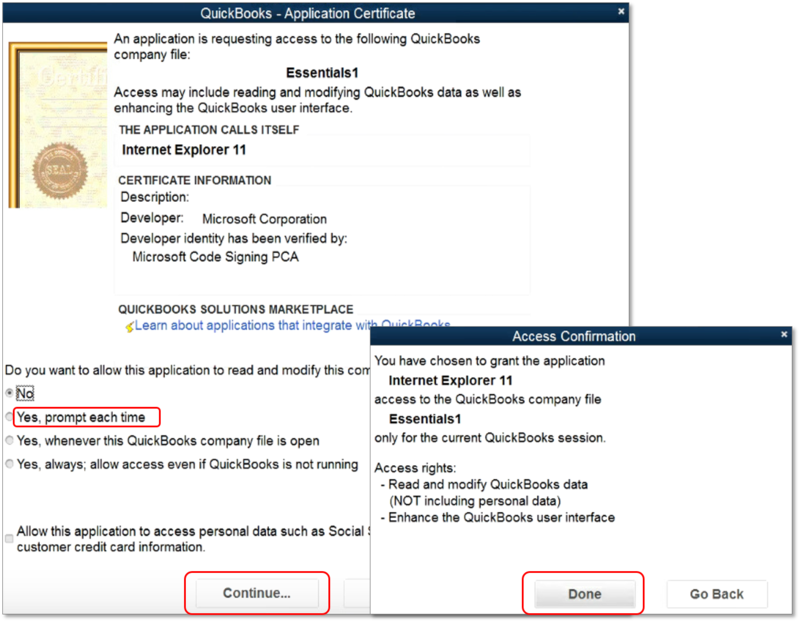 Here's a visual guide you can use when exporting your data from QuickBooks Online to QuickBooks Desktop. QuickBooks Online is not compatible with the 64-bit version of Internet Explorer in Windows 7. Make sure that you have the 32-bit version of Internet Explorer instead. You must be logged in as an Admin user on both QuickBooks Online and Desktop for this process to work. 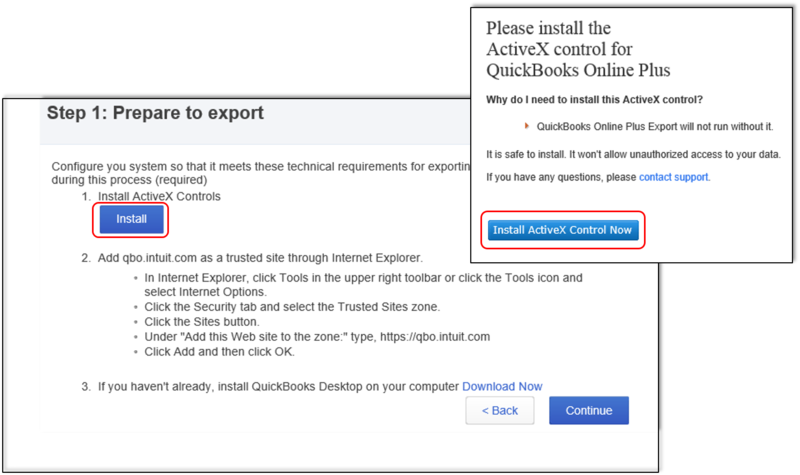 If you're having trouble installing the ActiveX control or getting error messages, see Can't install ActiveX control in Internet Explorer when exporting QuickBooks Online data. 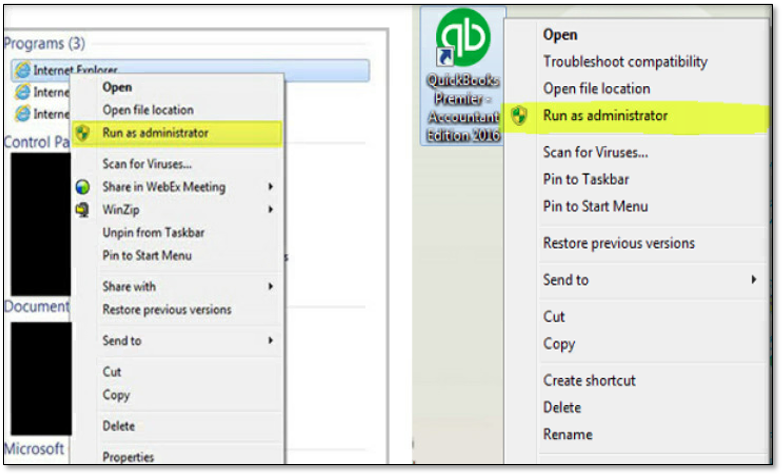 Run Internet Explorer and Quickbooks Desktop as the Administrator even if you are logged in to your computer as the Admin. 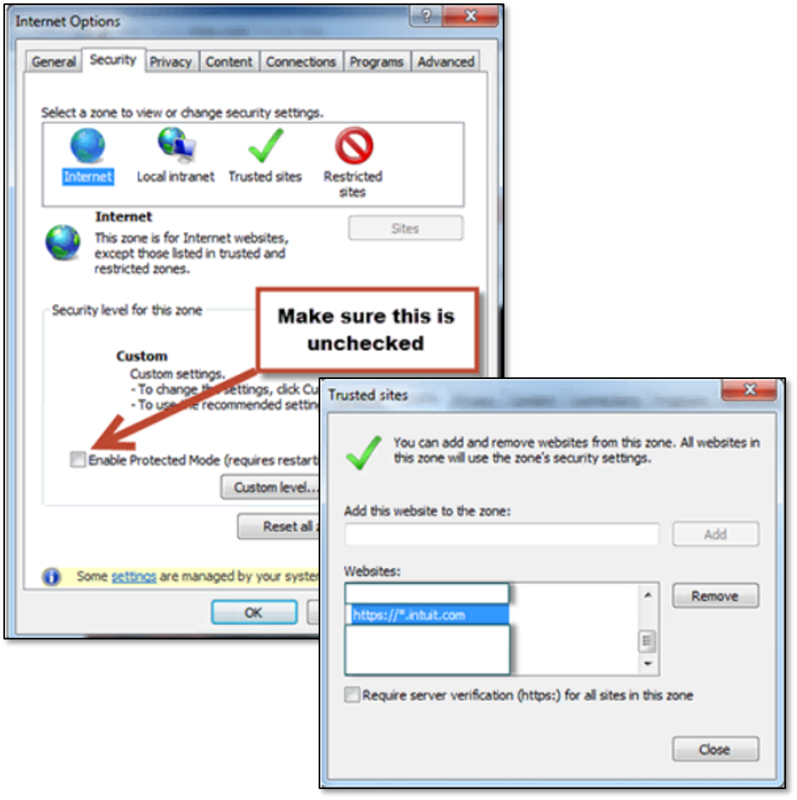 Turn off Protected Mode from Internet options (Alt+X), then add https://*.intuit.com, https://*.qbo.intuit.com and https://*.quickbooks.intuit.com to your browser's Trusted Sites Zone. Note: After doing this, you will have to close/re- open Internet Explorer for Protected Mode to be truly disabled. Repeat step 1 before opening Internet Explorer if you have to disable Protected Mode. In QuickBooks Online, select the Gear icon at the top. Under Tools, choose Export Data. Note: A pop- up window appears with a quick question about your reason for exporting. Choose your reason, then select Continue. Under Moving to QuickBooks Desktop?, select Learn more. Under Download company data, select Learn more. Review the export overview, then select Get Started. Select Install for the ActiveX control, then choose Install ActiveX Control Now to confirm the installation. Note: There will be another window that will prompt for the next step to install ActiveX. After successfully installing ActiveX, select Continue. Choose the data you want to export. At the bottom right, select Continue. Review the limitations of the data that will be exported, then select Continue. Enter your contact information. At the bottom right, select Continue. Note: You will receive an email with steps to complete the export conversion within a few minutes to 2hrs, depending on the amount of data that is being prepared. Receipt of this email means the data has been compiled and you are ready to move on to the next step. Repeat step 6, then follow the prompts until you reach the screen that shows the next step. Choose your preferred option. At the bottom right, select Continue. Follow the steps, then select Download. A pop- up window will appear and ask where you’d like to save the file (we suggest the Desktop folder), then select Convert Now. In the Application Certificate, choose Yes, prompt each time. Select Continue, then choose Done. At the bottom right, select Finished. Run some reports to confirm that your data is successfully converted. We suggest you run 2 reports in both QuickBooks Online and in QuickBooks for Windows to ensure your data was transferred correctly. Ensure that you are running the reports to include All Dates. Your accounting method must be set to Accrual. Important: If you lowered your security settings in following the steps, be sure to change them back so that you don't leave your computer open to viruses when navigating to other websites in Internet Explorer.